If you had any qualms about the previous iteration’s understated exterior and wished for a bit more oomph, the post-facelift Toyota Camry is just what the doctor ordered. It has great road presence and managed to turn quite a few heads wherever we went. The nose has been thoroughly revised and looks very striking with its wide air dam, aggressive headlamps and some tastefully-executed chrome highlights. 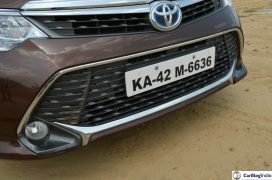 The Camry has a very sharp chin that is accentuated rather well by the interesting chrome detailing around the lower edge of the front bumper. 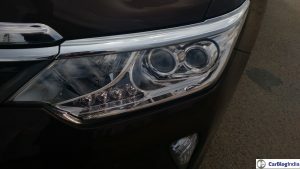 Illumination is taken care of by nicely detailed headlamps which get integrated LED daytime running lights along with a combination of projector lamps and LED fixtures. 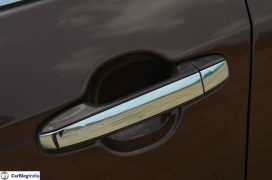 The turn indicators are placed below in the bumper, which is an unusual, but nevertheless an interesting position. 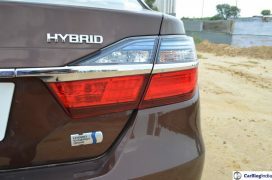 It is one of the styling cues which help distinguish the Hybrid from the standard version. 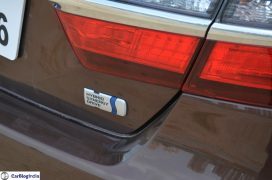 The other ones are the blue highlights in the Toyota insignia and, quite obviously, the Hybrid badge. The side profile, in stark contrast to the front, is a bit plain jane. It reveals a standard three box shape with chrome finish door handles and chrome lining for the window area. Apart from the classy alloy wheel design, there is nothing much to talk about here. However, it does give a fair idea of oodles of interior space the car has on offer. 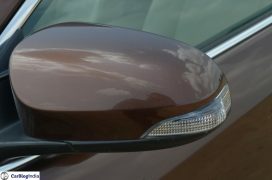 Toyota has made slight tweaks to the rear, which includes adding a chrome strip that runs across the boot and through the tail-lamps. The back bears a strong resemblance to old Lexus sedans (LS600 in particular), which is not really a bad thing. 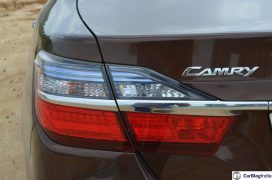 Overall, the Camry is much better looking than before and does justice to its premium pricing. It’s a definite head turner, something that is sure to leave you grinning with pride. Step inside and you will be greeted by a rich interior with a pleasing colour palette – a combination of black and beige with tastefully added silver and wood finish accents. The steering feels good to hold, although it is slightly large. The button layout reminds us of a video game controller, which we actually quite like. 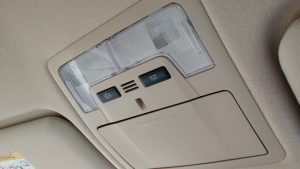 The centre console is neatly laid out with a touchscreen in the middle surrounded by the usual set of buttons and the 3-zone aircon controls. For some strange reason, the touchscreen does not support navigation which is a bit of a letdown. The electronically adjustable front seats get memory function and are ventilated which is a boon in India’s sweltering heat. While the quality of the wood trim and the general fit and finish is impressive, it still feels a notch below the Europeans. There are plenty of cubby holes all around and we especially like the cavernous storage space provided under the front centre armrest. Rear seat space and comfort is where the Camry excels as it gets oodles of legroom, ample head and shoulder room and enough features to keep the backseat passenger occupied. Among the highlights here are the reclining rear seats, complete audio controls and separate aircon controls for the rear, all of which make the Camry a great car to be driven around in. Feature-laden, plush and comfortable – the cabin is worth every penny spent. In our drive around the city we encountered everything from congested city streets, stretches of brilliant expressways and roads bad enough to scare ‘rally-prepped’ cars. 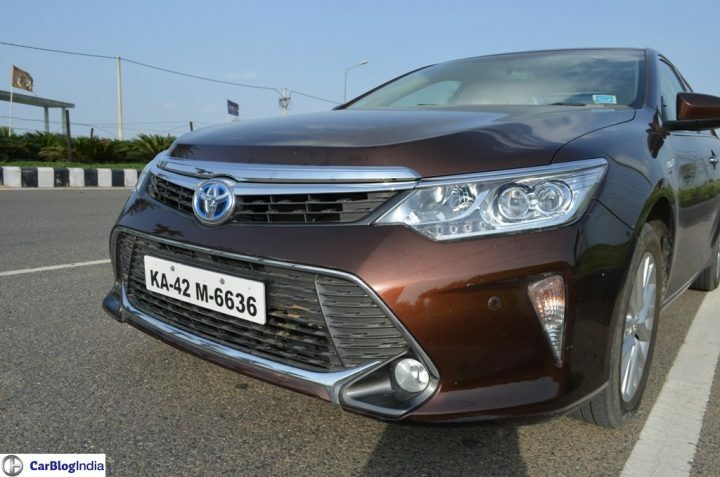 This executive sedan from Toyota wafts over bad roads with ease, which is thanks to the soft suspension setup, but the cabin is not impervious to bumps and undulations that filter in from time to time. 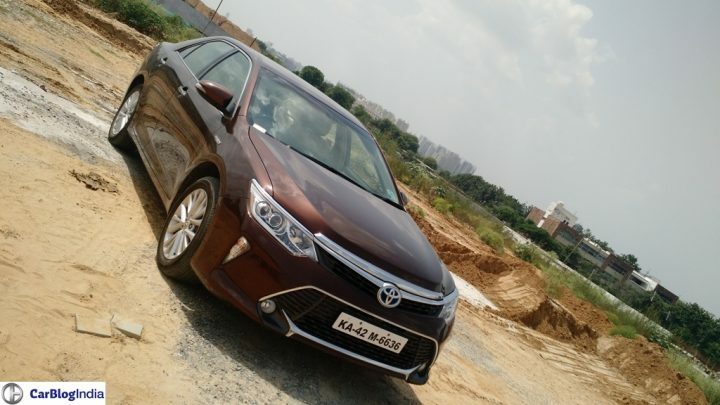 Nevertheless, overall ride quality is very impressive and the Camry turned out to be immensely comfortable both around the city and out on the highways. The sedan is more at ease when driven around in a relaxed manner and isn’t too fond of being driven hard. Having said that, it is very quick off the line, enough to pin you back firmly to the seat and smoke most cars at traffic-light GPs. 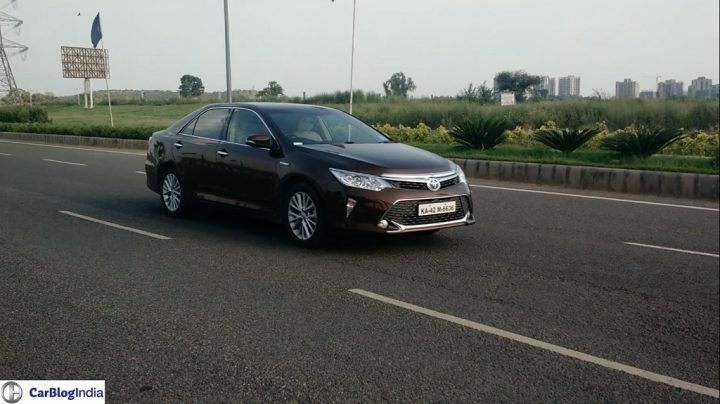 The light steering makes tackling the city traffic a breeze, but unfortunately, it does not weigh up well at higher speeds, which means the Camry doesn’t inspire enough confidence when corner carving. 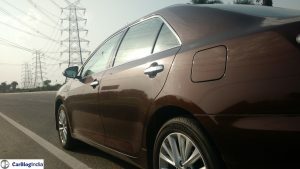 Being a hybrid, the Camry benefits from a combination of petrol and electric power. The petrol unit is a 2.5-litre VVT-i producing 160 PS and 213 Nm and the electric motor puts out 143 PS and 270 Nm to give a combined power rating of 205 PS. 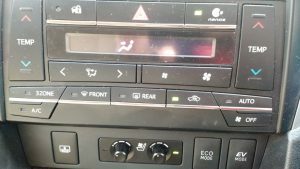 Press the start button and the car idles without a sound indicating the petrol motor hasn’t come to life yet. The car can start off with just electric power and then the petrol motor joins in as you build momentum. All this happens seamlessly and the switch from electric to petrol and vice versa is unnoticeable. 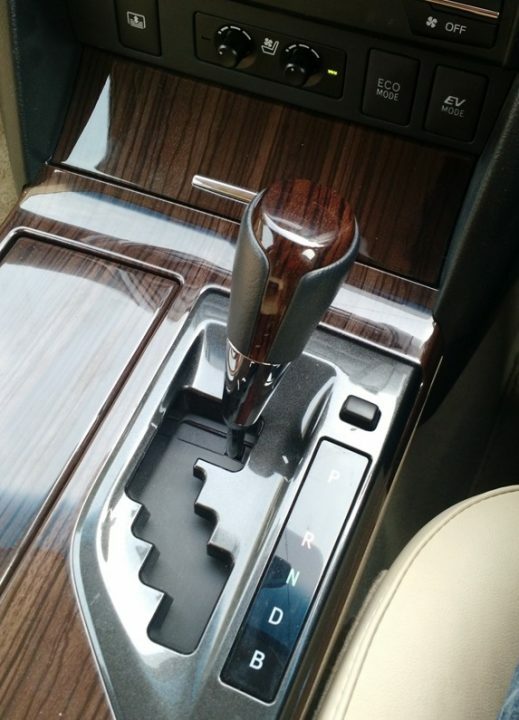 Slot into D and put your foot down to have the Camry move forward quickly. The Camry can dash from 0 to 100 km/h in just 8.49 seconds, which is pretty impressive for a car of this size. 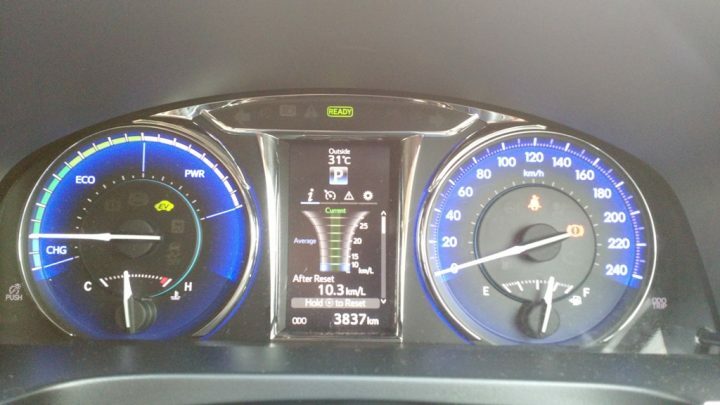 There is an onboard CPU which controls how the combination of petrol and electric power works to return a claimed mileage of around 19 kmpl. Its eco-friendly credentials are further boosted by reduced emissions and utilization of energy lost during braking to charge the battery pack. Power is transmitted to the wheels via an E-CVT automatic which does the job pretty well. The rubber band effect commonly associated with CVTs is barely noticeable. However, there is no manual override and there is a slightly annoying whine from the engine during hard acceleration. The Toyota Camry Hybrid has ample power to keep even the enthusiast happy while being easy on the pocket and the environment. The Toyota Camry’s natural rival is the Skoda Superb, but the former’s pricing drags it into entry-level German luxury sedan territory. At INR 31.9 lacs (ex-showroom, New Delhi) it is considerably more expensive than its Skoda-badged adversary, but it does come with the hybrid advantage and in our opinion, is much more luxurious and feels more premium than the Superb. 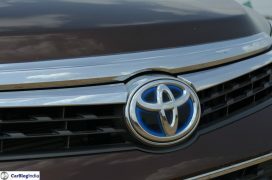 And then, there is Toyota’s rock-solid reliability and an after sales service which only adds to the positives. The Camry offers enough space to put German sedans higher up in the pecking order to shame and is also supremely comfortable, especially if you’re looking to be chauffeur-driven. 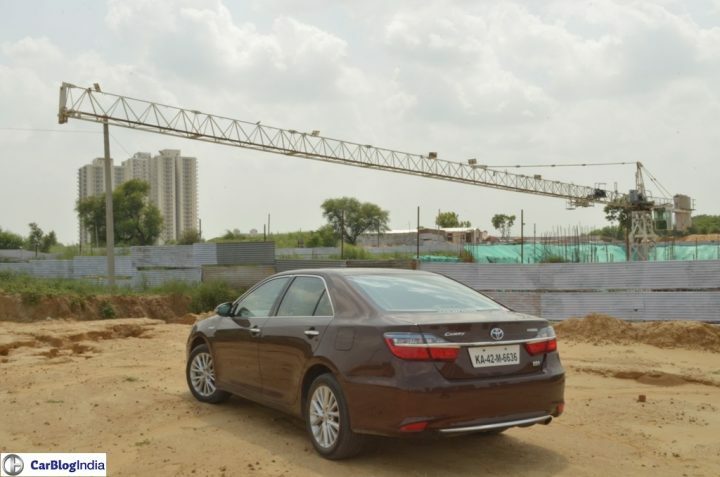 Although looks are a matter of personal taste, we wouldn’t be wrong in saying that the Camry looks stunning from most angles and at 4.8 m in length, it can result in an envious neighbour or two. 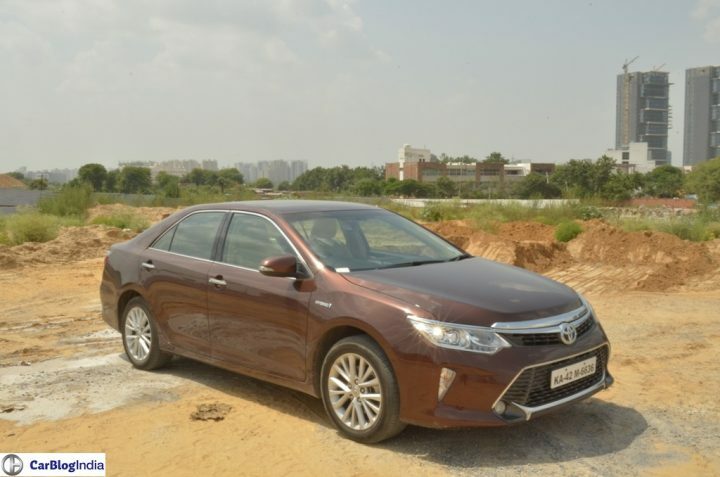 The Toyota Camry Hybrid scores high on practicality; it pampers its occupants with comfort and features, is eco-friendly, boasts of strong green credentials and, for a car its size, is easy on the pockets too. 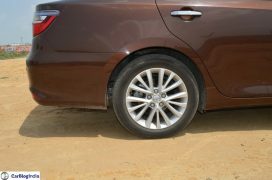 We are immensely impressed by this competent executive sedan and we are sure you will be too. 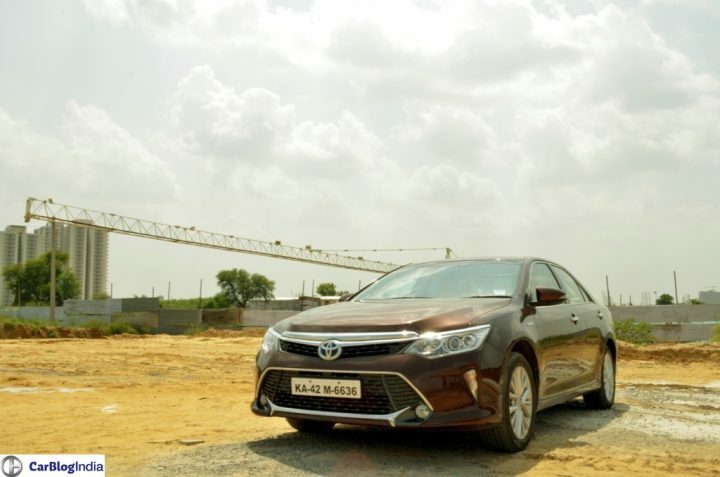 The Camry appeals to the heart as much as it does to the head and rest assured, you will not go wrong putting your money down on this mighty executive sedan. 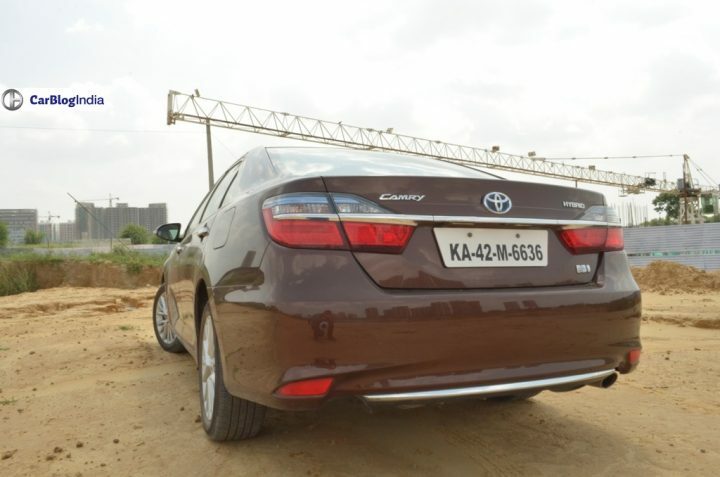 So, what do you have to say about our 2015 Toyota Camry Hybrid review? Do share your views by penning them down in the comments section below.